Cats have lithe, muscular, compact, deep-chested bodies, with strong legs and large paws. In most species the claws are retractile (to prevent blunting of these important predatorial weapons), sharp, and strongly curved (which aids them in holding prey). Pads of the feet are naked, but the rest of the foot is well haired to assist silent stalking. The head is round and shortened, the eyes have pupils that contract vertically. The tongue is "covered with sharp-pointed, recurved, horny paipillae" (Walker II:1187), suiting it for laceration and retaining food within the mouth. Teeth are designed for seizing and cutting rather than for grinding. Cats prey on almost any mammal or bird they can overpower, and sometimes even fish or reptiles. Nearly all of them stalk their prey, and most are solitary animals.. Catlike creatures first appear in the fossil record during the Oligocene epoch in North America (35 million years ago [Ma]), but new DNA evidence (see "Evolution of Cats", above) suggests that the ancestral form of all living cats emerged in Asia, and that recent distributions of the Felidae are results of multiple cross-continental migrations. For more details on evolutionary relationships, see "Evolution of Cats", above, and also the main Mammals page here. Our Mountain Lion is a member of the Puma lineage of cats (along with today's African Cheetah and the Jaguarundi, a smaller cat that lives mainly south of the U.S. border), which separated from the other lineages in North America (fossils of all three of these cats are found here). 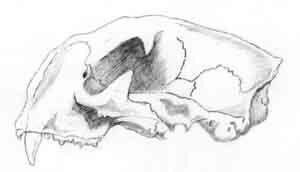 The Cheetah spread into Asia and thence to Africa during the Pleistocene, while the cheetahs and other lions of North America (including the Mountain Lion) were extirpated there at the end-of-Pleistocene extinction event which also eliminated many other large North American mammals. (See Pleistocene Megafauna for discussion of this sudden extinction, which may have been caused by a catastrophic bolide impact over North America that occured about 12,900 years ago and marked the beginning of the Younger Dryas Cold Spell. In any case, our Mountain Lion escaped total extinction at this end-of-Pleistocene event because some of its population had migrated into South America some two or three million years earlier (returning northward more recently, some 8 to 10,000 years ago). Today, the Mountain Lion has a wider distribution in the Western Hemisphere than any other mammal except Homo sapiens, thriving from lowland tropical forests, swamps, and grassland, to mountain conifer forests, desertscrub, and any location with adequate cover and prey. Before European incursion on the continents, Mountain Lions lived from the Canadian Yukon to the tip of South America, and from coast to coast. Europeans, however, have waged relentless war on these animals, until by 1900 these cats were almost entirely exterminated east of the Mississippi River. (Today only Texas continues to grant hunters totally free rights to kill, while California completely protects the animals.) 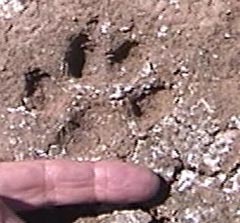 Destruction of their habitat is an even more pervasively serious threat -- for example, in our part of the southwest, the Tucson Mountains (formerly good Mountain Lion habitat) has become so surrounded by housing developments that recent surveys show no sign of adult male lions there. Color varies considerably in mountain lions, from the tawny buff and rufous shown in our local photographs here to a silvery or even bluish grey. They average about the same in size as the leopard (Panthera pardus) of Africa and Asia, males (the larger animals) running from 180 to more than 200 lbs, and from 41-76" in head-and-body length, tail length 21-38". The largest male recently measured in our area was somewhat over 200 lbs. In our area the tawny back and light-grayish belly we see above and at left are characteristic, as are dark brown around the ears and on the sides of the nose. Chest and belly are generally whiteish, as is an area around the mouth. 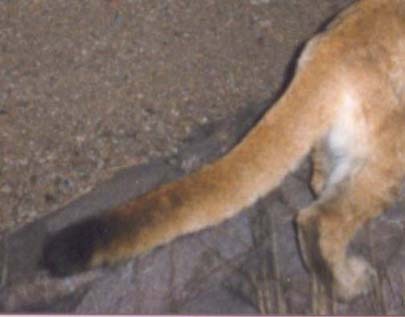 Note here the very dark tip of a very long rusty-colored tail (especially noteable in the photograph at left), and also the darkish coloring of the underleg hair below the hock. Mountain Lions range very widely (may move as much as 100 miles away from their place of birth), usually have no fixed den (except when females rear young) and may use any concealed, sheltered spot as a den. The voice is like a much magnified tomcat. They breed at any time, giving birth to 3 or 4 kittens which are spotted (with largish, rather scattered spots). Cubs are born with eyes and ear canals closed, but within two weeks the eyes open and by two to three months the cubs are weaned. They remain with their mothers for as much as two years. When males leave their mother they may wander long distances before establishing a new home range. 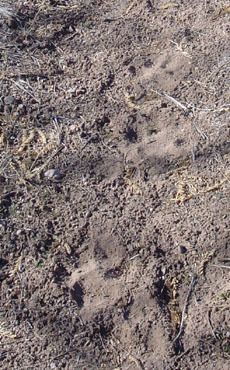 Below, left and center: mountain lion tracks in soft duff and silt, running downstream along an old cow trail near Rabbit Ears Saguaro Hill in Lower Hot Springs Canyon. The tracks are fresh, probably from the previous night, and 3 1/2" across. We followed this track for about a mile along the faint duff-covered trail. 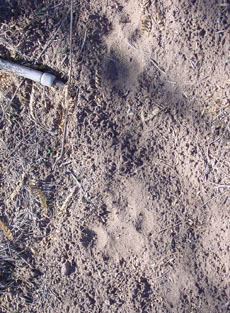 At right: a track in the mud of the Diversion Tank. The width of this one is just short of 3".